Of course in all great cities you walk and walk and walk. In Paris, you like me, perhaps choose to walk in good looking shoes. So, by the time evening rolls around, you are left sitting somewhere with very tired feet. If you happen to be on the Left Bank, near Notre Dame, walk a few steps more and find yourself at L’Heure Gourmande located in the courtyard (Passage Dauphine). 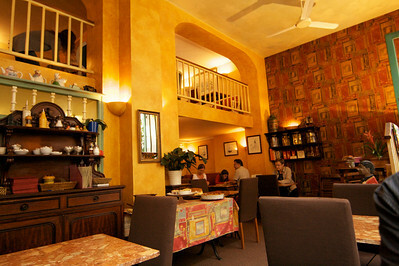 It is a tea house and among other things, they also serve bitter Chocolat à l’Ancienne and at the time of writing, it is open daily between 11:30 a.m.- 7 p.m. What is Chocolat à l’Ancienne? 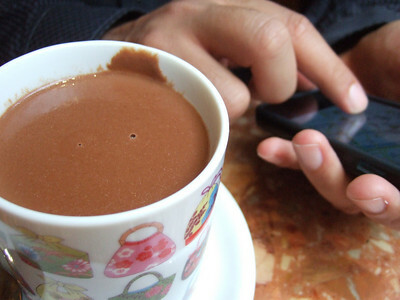 It is melted chocolate with a touch of cream, not too sweet, and textured like a slurry. It is a tea house, so it also serves assortment of tea and cakes. In fact as you walk in, you see a table where all the cakes are placed and you can get the cakes by the slice. Ambiance is relaxed and one can either sit out in the courtyard or inside. If you plan to walk as much as I did, a chocolate break won’t be enough to rejuvenate your feet. If, however, you are a Hollywood Golden Age film buff, you are in luck. 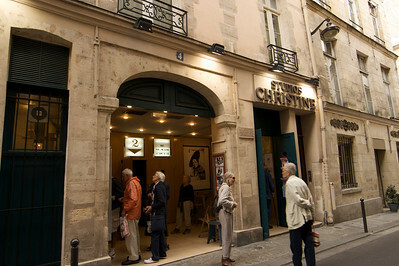 Within a stone’s throw from the tea house, Cinema on Rue Christine screens these gems with shows every two hours or so. We were in double luck with Lady in the Lake, a classic noir based on Chandler’s novel. Perhaps, I would have preferred Simenon’s Maigret on a Paris trip but watching a Hollywood classic with Parisians who clearly were enjoying Marlowe’s wise cracks via subtitles was equally captivating. 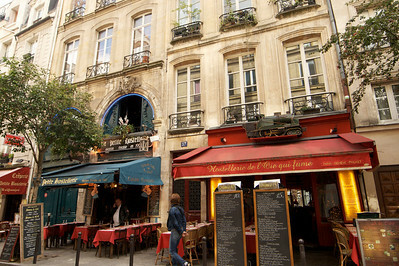 After movie, you can eat dinner at one of the several tourist attractions in Latin Quarter for an easy meal or head to Le Reminet for a gourmet one.